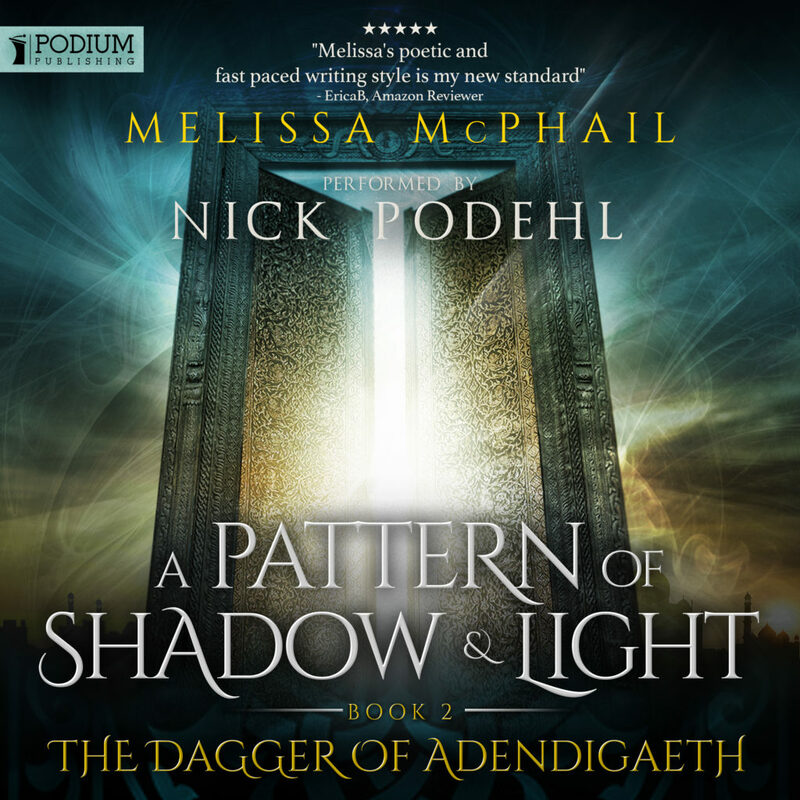 Today the audiobook edition of The Dagger of Adendigaeth releases on Audible. Yay! Grateful thanks to Podium Publishing and the talented Nick Podehl for bringing my award-winning fantasy series to audio life. (I have to say that for SEO purposes – not just trying to toot my own horn, here). Dagger is set up with Whispersync, for those of you wanting an immersive experience. For some reason there is a delay on getting the Whispersync functionality available for Cephrael’s Hand, but I’ve been assured it’s in the queue. My deepest gratitude to those of you Audible listeners who posted ratings for Cephrael’s Hand. It’s gathered over 200 ratings and a 4.5 star average since its release at the end of July. Please think about rating Dagger also. Your reviews and ratings are truly appreciated! Since I know you so well, the rest of this post about Kingdom Blades. The good news is Kingdom Blades is fully out of my hands. Now you’re probably saying, “That doesn’t sound like such great news, Melissa,” but the reason it’s good news is because it means the book has finished the editorial process and has moved into production. And so…(drumroll please)…Kingdom Blades will release on ebook on October 28th. “WHY SO LONG?? ?” (see, I know all of you are asking this in ALL CAPS with three question marks). You have instinctive insight into the publishing industry and know, in truth, that I could release the ebook on Amazon probably tomorrow. Well, it does have to be formatted for Kindle and Nook, et al, but that work aside, yes, your instincts guide you true. It could be released sooner. But if I did that, there is no chance of the print editions being released at the same time. The chance is slim as it stands right now, but as Fynn, Carian and Trell would all claim, slim is still a chance for success (and while they would all be making this claim for vastly different reasons, the point remains valid). Now, I know you ebook people are special, but what kind of inconsiderate publisher would I be if I only saw to the needs of my ebook readers and ignored those traditional readers who desire a book in their hand to truly enjoy the experience? I won’t be accused of discrimination. So I’ll take that slim chance and pray to the stars that Amazon and others will have the print editions uploaded in their catalogs by October 28th so everyone can have an early Christmas. When I know more, you’ll know more. In the meantime, you can enjoy a refresher by listening to the series on Audible! And hey, if you’re one of those people, drop me a line on how you’re enjoying it. I would love your feedback. Yesssss!!!!!! Thank you, Melissa! Can’t wait to read Kingdom Blades! This has made my day! Will it be possible to pre-order Kingdom Blades? I am hoping to get a copy before my holiday in November. Jason, if you read on Nook or epub you’ll be able to preorder through iTunes, GooglePlay, B&N or Smashwords. I’m not opening preorders on Amazon because it messes with the book’s rankings (basically, they don’t count the presales as release day sales). So you won’t be able to purchase it on Amazon until the 28th. Hopefully you’ll still get your copy in time! That’s great, thanks for letting me know. I will be purchasing on the 28th! Right around the corner!! Awesome news, I can’t wait to dive back in! That’s great news, really looking forward to reading book 4 :-), currently on my re-read, about 75% through the Paths of Alir. This is a great series Melissa, it doesn’t seem to be as popular as it deserves, so I hope book 4 increases your fan base. Many thanks for keeping us updated! Thanks for the great news! Been awaiting this book eagerly. Busy week for reading with Kings revisions to The Gunslinger and Weeks release of The Blood Mirror. Do you authors get to gether and plan on how to give us new release overload? Already have ” Dagger” downloaded and qued up…as soon as I finish my current book I will start. Great news about “Kingdom Blades”, too. October is not such a long wait. Also, I hope Audible is as expeditious with “Paths Of Air” as they were with ” Dagger”…their timing was almost perfect. That’s great to hear, Garry. I don’t have much say in the release date of Paths, but I know the audiobook is already in post-production. There’s certainly a chance it will be out before the end of the year, based on the timing of book one and two. Thank you for listening! When is book 3 on Audible? October? I’ve read all three books, I’m happy to see the 4th book will be available soon. Any idea when the audio book for 4 will be available as the third book? Just thought I’d ask. Love audio. Busy life and not time to sit down and read. I’m so glad you’re enjoying the series so far, Victor. Paths of Alir is in post-production for Audible. I imagine it will be released before the end of the year, but I don’t have confirmation on that yet. Kingdom Blades is in pre-production but hasn’t yet been recorded. When will book 3 and for be available in audible. I’m a truck driver and can’t always read traditional books. Yes, Toni. Paths of Alir is in post-production now. I would imagine November, but that’s just a guess. When I know more, I’ll post here and to my facebook page. Tony, I too drive Truck. I read at night instead of TV. Helps to relax and keeps the mind better in tune. Hey Melissa! I recently finished the Dagger of Adendigaeth and I loved it! It was superbly written and I love how you didn’t drag out certain story lines. (looking at you wheel of time). The Pelas arc was especially moving. While I know that he has somethings he needs to do to make up for his sins, I think he’s doing pretty well for being a creature made of the primordial darkness of the universe. His interactions with Tanis were some of the best writing Ive read in a long time, and I will admit, I clapped a bit when Pelas started to treat Tanis like a little brother. It was so sweet. Im very curious about when the next book will come out on audio as I very much want to listen to it but I also can’t wait too long. I need to know what happens!! I’m thrilled you’re enjoying the series so far, William. There’s lots more to Tanis and Pelas’s story coming in Paths of Alir. Book 3 will be released on Audible on October 18th, so you won’t have too long to wait. Thank you for listening! Quick question: I just went to Amazon, but the only 2 options were paperback and hardcover, will this be released for Kindle at the same time (or other ebook format)? Yes, Tim, but you won’t be able to download the kindle until the day of the release. Sorry for the inconvenience, but Amazon penalizes you for kindle presales. I just found your series about a month ago. I just finished up grad school and started my career as a therapist so I do not have much time for traditional reading. I rely on audio books to get my fix ( the residential treatment center I work at is in the middle of nowhere so I get plenty of time to listen). I am just now finishing up book 3 and my heart breaks to learn it may be a while before Listen to kingdom blades. Great work! I am glad I found this story. Thank you! I love your books!!! I am truly a fan! Just finished listening to Paths of Alir on Audible and it has been more exciting than most movies currently! That’s a pretty amazing accolade, Wendellyn. I’m honored.